Made from cold rolled steel, 67/68 Pneumatic, Ever-Roll and Eco-Rubber Casters also feature double ball swivel raceways. 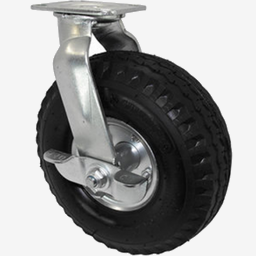 Three different shock absorbing wheel types provide the maximum cushioned ride available. Each wheel has unique characteristics and advantages to consider. While some applications include carts, and platform trucks, these can also be found on equipment used in industrial, commercial, institutional, and outdoor environments. In these applications, a cushioned ride and the ability to roll over uneven floors and debris is a must. 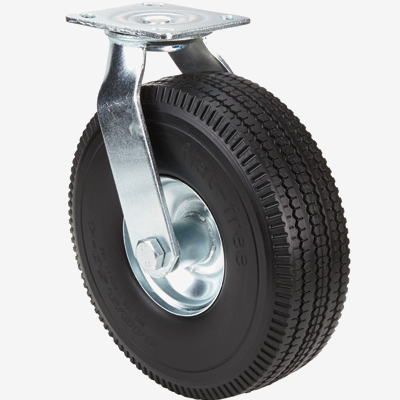 These offer good floor protection and a quiet rolling operation, and they can come with brakes as well as swivel locks. The standard zinc plated finish is attractive and also resists corrosion.